I don’t intend to write many reviews on the relaunched version of this site – I don’t have new products passing through my hands in the kind of volume I used to, so I don’t have much to add to the conversation. That said, occasionally I still take a chance on an unknown or little-known product and like to share my thoughts. 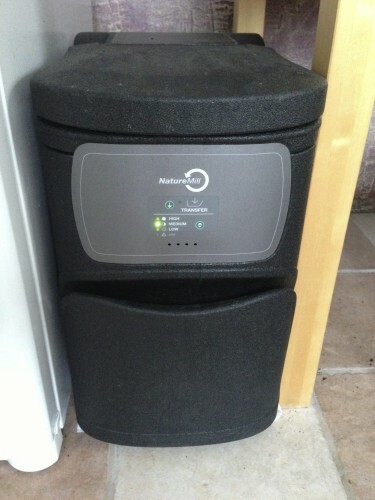 In this case, it’s the NatureMill Neo Compost Bin. NatureMill makes automatic indoor composters. The Neo is part of their new (3rd generation) product line. I bought mine in August of this year, and have lived through enough of the ups and downs that I feel ready to give a verdict. The NatureMill product line aims to be a self contained, accelerated composting solution. You put compostable stuff in the top, and a week later, nutrient-rich compost comes out the bottom. It lives in your kitchen, and becomes an easy alternative to dumping stuff in the trash or disposall. I was attracted to the NatureMill for a few reasons. First, I’ve never found a good place for a compost pile in my yard. Between neighbors, the dog, and the yard layout, it just hasn’t made sense. Additionally, being in Minnesota, compost piles are relatively unproductive in the winter months – plus it’s not much fun to have to dig through the snow to find your compost. However, the vast majority of the waste generated in my household is compostable – working from home and being a bit of a foodie, I do a fair amount of “from-scratch” cooking each day, which means there’s plenty of onion skins, apple cores, and carrot shavings going into the trash on a routine basis. 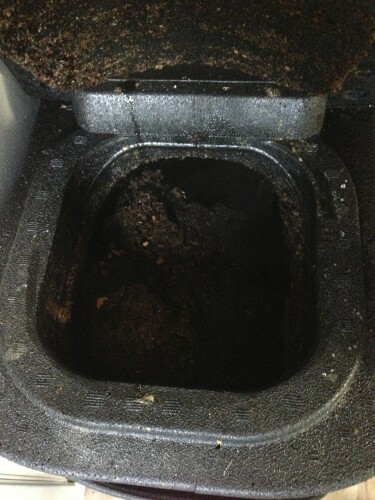 And then there’s the coffee grounds! NatureMill products are essentially composting Rube Goldberg devices. There are two chambers. You add your compostable items to the top. Inside that chamber is a metal mixing bar. This bar is activated periodically to stir and break apart items. The chamber is also heated and has an air pump. These combine to supercharge compost microbes. When the top chamber is full and broken down into compost, you trigger a transfer, which causes the compost to drop into the lower area. This area houses a tray. You leave the compost in there until your next load is ready, giving it time to dry and cure. When you’re ready, pull the tray out and spread it on your garden (or store it for Spring). So, how does it all work? In general, surprisingly well. It’s kind of awesome to dramatically cut down on the amount of waste generated in my kitchen, and the rapidity with which it turns into compost continues to shock me. So, two thumbs up then? My first NatureMill Eco self-destructed, quite dramatically, after about three weeks. The mixing bar jammed, but the motor did not cut out like it should have – instead, the torque literally split the entire unit in half, as the motor tried to escape. Needless to say, it made a bit of a mess. Disappointingly, the NatureMill customer service seemed relatively unconcerned. Repair turnaround was nearly a month, with little communication about the process. Frankly, I was surprised they didn’t just cross ship a replacement unit to me immediately. The repaired unit has been up and running for about two months now, and seems to be operating fine, so for now I’ll call it a fluke. Rube Goldberg devices have a reputation as being pretty fiddly and high maintenance, and this is no exception. First, your food waste must be balanced with an occasional scoop of sawdust pellets and baking soda to deal with excess moisture and smells. While not difficult, the need to find and maintain this balance makes the unit less like a trashcan and more like a small pet. The unit can also become jammed if you add too much at once, which can be a problem when cooking large meals. That said, I was able to add nearly all of the waste from Thanksgiving dinner without a problem. The final negative is the noise – especially out of the box, the air pump is surprisingly noisy. Additionally, when the mixer runs, it makes quite a racket. As the unit fills up and the pump wears in a bit, the whole thing quiets down, but the initial out-of-the-box experience is pretty dispiriting in that regard. Some owners have concerns about smells, but I haven’t noticed any issues in that regard – when adding items, you’ll get a whiff of the compost process, but it’s not particularly unpleasant, and doesn’t linger. So, the overall verdict then. It’s not a perfect solution. It’s relatively pricey. It’s fiddly. And it may occasionally explode. In regards to actually using the compost, I suspect it’d never be a cost effective alternative to just buying compost at the garden store – you can buy a lot of compost for $250. And yet, despite all of this, it makes me kind of happy – I honestly find it fun to get to add items and watch nature take its course. It’s one of the most flawed consumer products I’ve owned in years, and perfectly wonderful as well. Edit: One downside I noticed in digging a bit – it’s 720p or nothing, no option to shoot natively to a lower resolution. That’s one of the things I like about the Kodak – you can do 640×480 when you don’t need the quality and just want long record times. David Pogue has a pogueish (fun) review of Optima’s pocket projector. Probably a bit nicer, though much more expensive than the Aiptek unit I mentioned a few days back.